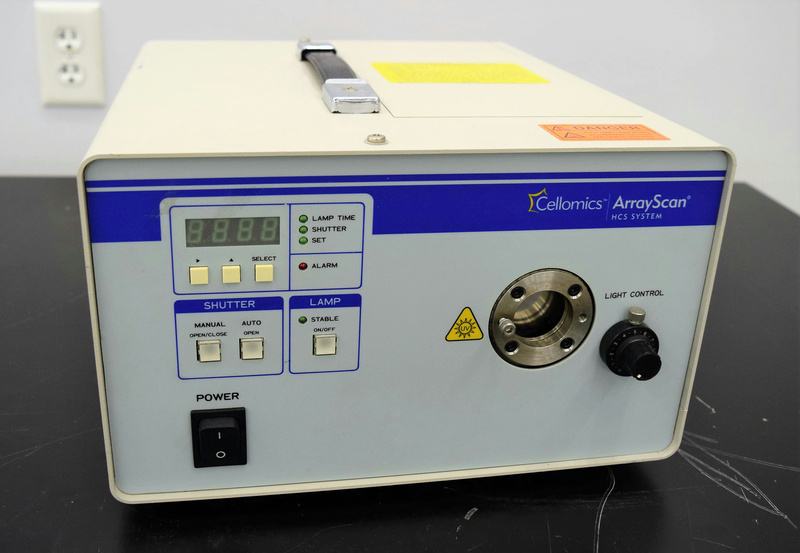 Thermo Cellomics L7212-44 Array Scan HCS Excitation Light Source Low Hours . New Life Scientific, Inc.
"The Cellomics ArrayScan HCS System is an automated system for screening arrays of fluorescently labeled cells within a microplate. It is designed for performing quantitative multicolor fluorescence intensity and morphological measurements of cells labeled with one or more fluorescent dyes. Measurements are made on a cell-by-cell or field-by-field basis within each well." New Life Scientific technicians tested this unit and evaluated its physical condition. The light source powers on and the lamp illuminates without hesitation, and the shutter works. There are 158 hours recorded of lamp lifetime used which the staff thinks is an accurate readout. This light source was confirmed functional and in good cosmetic. There are obvious signs of age and wear on the body, but this has not hindered its ability to function thoroughly. NLS does not have the light probes, additional cables, accessories, nor the HCS system and they will not be included.